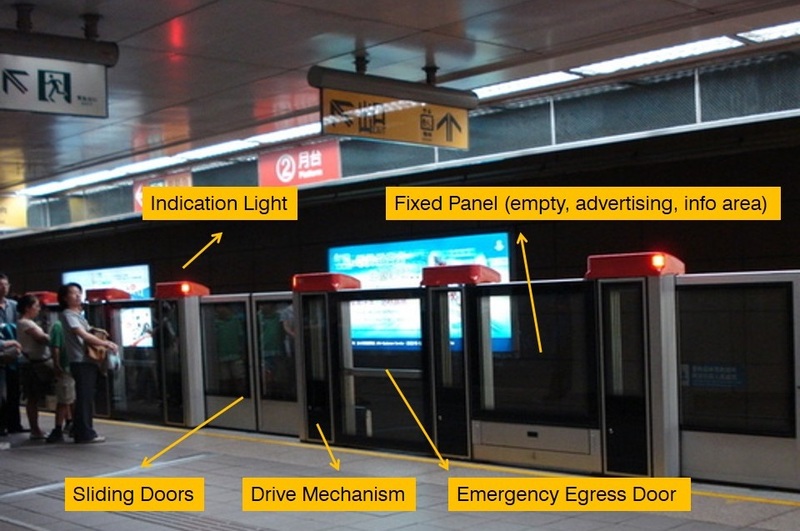 Platform screen doors (PSDs) and platform edge doors (PEDs) at train or subway stations screen the platform from the train. They are a relatively new addition to many metro systems around the world, some having been retrofitted to established systems. They are widely used in Asian and European metro systems. 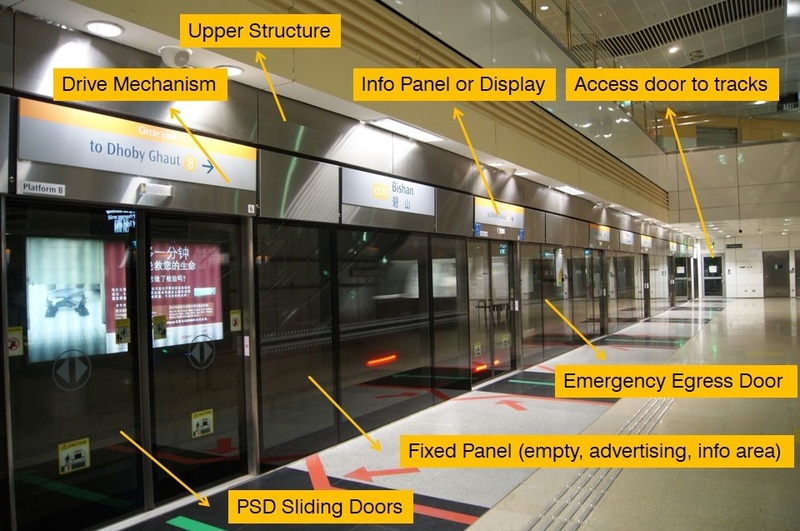 Although the terms are often used interchangeably, platform screen doors are full height, total barriers between the station floor and ceiling, while platform edge doors are full height but do not reach the ceiling and thus do not create a total barrier. Improve security — access to the tracks and tunnels is restricted. Lower costs — eliminate the need for motormen or conductors when used in conjunction with Automatic Train Operation, thereby reducing manpower costs. Prevent litter build up on the track, which can be a fire risk. Improve the sound quality of platform announcements, as background noise from the tunnels and trains that are entering or exiting is reduced. Their primary disadvantage is their cost; installing a system typically costs several million USD per station. When used to retrofit older systems, they limit the kind of rolling stock that may be used on a line, as train doors must have exactly the same spacing as the platform doors; this results in additional costs due to depot upgrades and otherwise unnecessary purchases of rolling stock. The doors also pose their own safety risks. The primary risk is that people may be trapped between the platform doors and the train carriage, and be subsequently crushed when the train begins to move. Cases of this happening are rare, and may depend upon door design. Automatic platform gates (or platform edge doors or half-height platform screen doors as referred to by some manufacturers) are chest-height sliding doors at the edge of railway platforms to prevent passengers from falling off the platform edge onto the railway tracks. Like full-height platform screen doors, these platform gates slide open or closed simultaneously with the train doors. Half-height platform gates are cheaper to install than platform screen doors, which require more metallic framework for support. Some railway operators may therefore prefer such an option to improve safety at railway platforms and, at the same time, keep costs low and non-air-conditioned platforms naturally ventilated. However, these gates are less effective than full platform screen doors in preventing people from intentionally jumping onto the tracks.